Mr. Marcite, Inc. was established in 1985 by Patrick T. Mahoney. Already a veteran of the pool industry, Mr. Mahoney and his team gradually generated an exceptional word-of-mouth buzz in the Venice community. In three short years, their local demand and service area grew by leaps and bounds and by the time the company incorporated, in 1988, Mr. Marcite had garnered a hard-won reputation of integrity and superior workmanship. Over the years, many changes have come to what began as a small, specialized endeavor and Mr. Marcite continues to keep on the cutting edge of nationwide industry developments while still maintaining a common sense focus on proven techniques that yield trustworthy quality standards. In 1993, our local service area was extended to include all the Florida Suncoast communities from Bradenton to Burnt Store Isles. In 1999, we established a permanent head office just behind the Venice Golf & Country Club, including a showroom where our customers can come, by appointment, to view and select the materials for their projects. 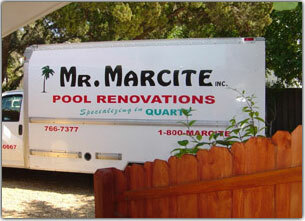 Today, the intimate crew that began in 1985 has expanded to include six specialized teams, sales and service associates, a fleet of company vehicles, a full office staff to set appointments and field customer inquiries, and a community standing that spotlights the pride and professionalism that goes into every Mr. Marcite pool and deck renovation. Copyright © 2019 Mr. Marcite, Inc. All rights reserved.